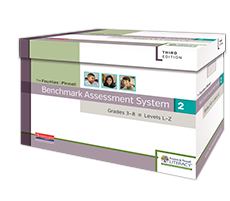 This professional learning opportunity provides an overview of The Fountas & Pinnell Benchmark Assessment System 2, 3rd Edition (Grades 3-8, Levels L-Z). Using the Fountas & Pinnell Benchmark Assessment Systems (BAS) to determine student independent and instructional reading levels, teachers are able to observe student reading behaviors one-on-one, engage in comprehension conversations that go beyond retelling, and make informed decisions that connect assessment to instruction. Participants in this session will learn how to administer, score, analyze, and interpret results from the BAS System 2. Participants will also explore how to use the data from the BAS along with The Fountas & Pinnell Literacy Continuum to inform instruction during whole class, small group, and individual teaching opportunities. Become familiar with the administration, scoring and analysis of the Benchmark Assessment System. Explore how to use assessment data to inform instruction during whole class, small group and individual teaching opportunities. Explore ways to use assessment results to group students and monitor student progress for change over time.